The EZCast 4K dongle is designed to make it easy to get content from your phone, tablet or computer onto the biggest screen in your room, whether that’s a TV, monitor or projector. It supports three popular standards — Miracast, AirPlay and DNLA — and is also available in app form for all major platforms. The EZCast 4K costs £48, making it some £20 cheaper than the similarly 4K-capable Chromecast Ultra. Let’s put it to the test! 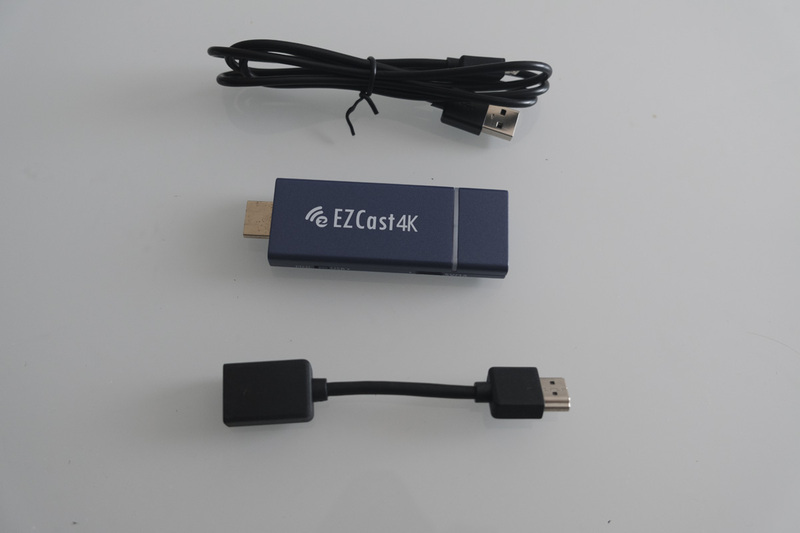 The EZCast 4K is a hefty dongle, measuring 13.5 x 8 x 3 centimetres and weighing around 100 grams. The boxy body includes a switch for selecting a power source, either USB (via a Micro USB input) or MHL (via HDMI). As the dongle is quite sizeable, an HDMI extension lead is provided to ensure it can fit into more cramped HDMI ports. An inoffensive blue LED shows when the EZCast 4K is turned on. A small but informative paper manual is also provided. 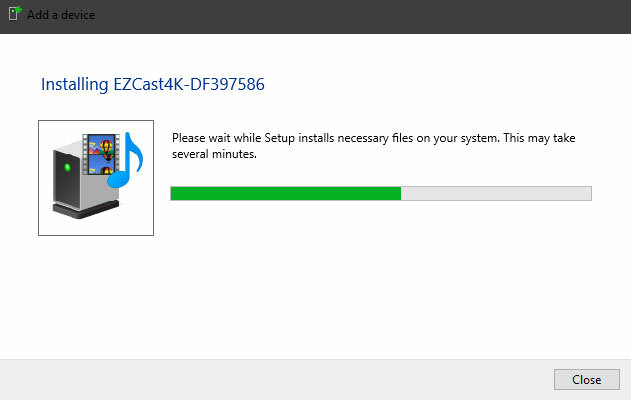 Setting up the EZCast 4K is pretty straightforward and only takes a few minutes. I used the EZCast 4K app on Windows to do so, but the process should be similar on iOS and Android. Use your device to connect to the Wi-Fi network generated by the dongle, then provide login information for your local Wi-Fi network. From here, the dongle (and your device) reconnect to the network you provided, and now you can talk to the dongle easily. You can actually start streaming content to the EZCast 4K in a number of ways. 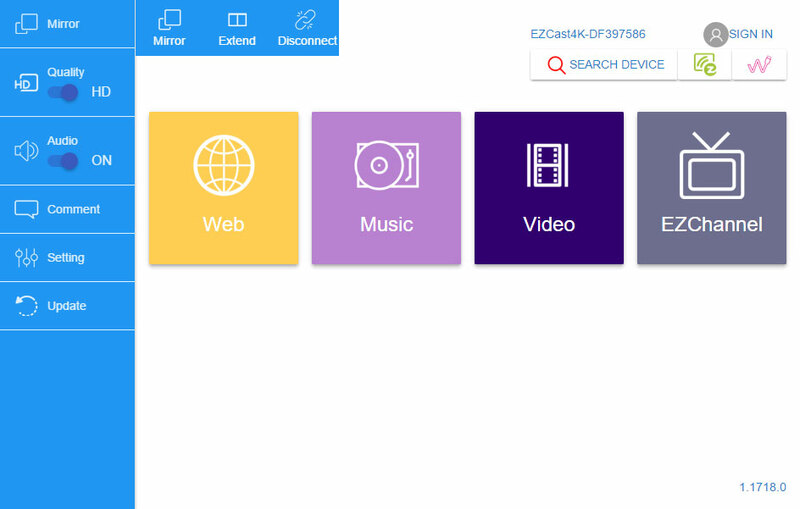 The apps include a number of built-in options; on Windows for example you can choose to mirror your screen, select a video or audio file on your computer, or cast a webpage. There’s also the option to access ‘EZChannel’, which appears to be a branded assortment of videos from a range of sources. I personally didn’t find this selection very appetising — even with all of my YouTube and Facebook information, the suggestions were way more hit-and-miss than anything I’ve seen on YouTube. However, the ‘autoplay’ function is presumably linked to this option, so if you’re interested in getting a continuous loop of videos (and you hate YouTube autoplay) then it could be worth exploring. 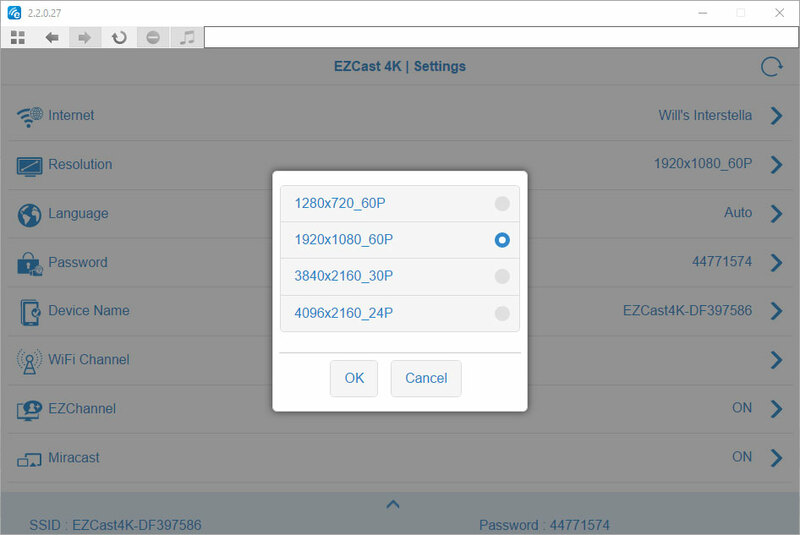 Asides from the app, you can also use any of the three standards supported by the EZCast 4K. You can use Miracast built into Windows, Android and other platforms to send video files directly, although on Windows 10 videos sent via Miracast only took up about two thirds of the screen. AirPlay is an option for iOS and Mac users, while DNLA allows you to access videos and other media on NAS storage, for example. In our testing, everything worked just fine, although often the sound would start playing before the video started. The two didn’t go out of sync; you just missed a half-second of video. However, we didn’t have access to a 4K display to really test the EZCast 4K’s titular ability. The dongle could certainly handle 4K video files, so we don’t foresee any problems there. 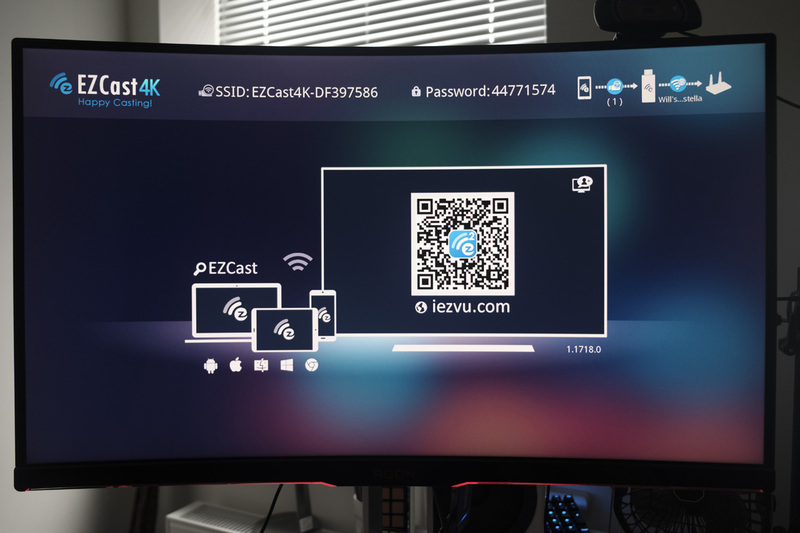 While videos, songs and mirroring all proceeded without incident, we found that the EZCast 4K was a little less polished than streaming devices from bigger names like Google, Samsung and Apple. For example, streaming a song to the dongle resulted in a progress bar and a basic visualiser being shown on screen, but not the name, artist or album of the song. Similarly, the app’s layout is a little haphazard; it looks like its functionality has been improved each time, but the overall design hasn’t been rethought to include all of the new actions. While the design isn’t top-notch, the app does work well enough, and there’s no poor English or spelling mistakes that you sometimes get on products that haven’t been created by native English speakers — so props to the EZCast team for spending some time to get these details correct. The EZCast 4K does alright. Its support for multiple wireless streaming standards grants it impressive flexibility, and it handles 4K at a price below that of the Chromecast Ultra, Apple TV 4K and many other competitors. It isn’t the sleekest package around, but it offers a sensible design and good value.